Have a customer account or perhaps a manager from another department that you need to convert into a support agent in your helpdesk? No problem! Trakdesk allows you to convert existing customers to support agents at anytime in a single click. Converting a customer to a support agent is permanent and cannot be reverted. However, you can delete the account at anytime. Also, if there are any custom fields associated with the customer, the data will be permanently deleted and cannot be recovered. Part time agent - Uses EasyPass credits to gain access to the helpdesk. Full time agent - Part of your monthly / yearly Trakdesk subscription. Login to your helpdesk as an administrator or an account that has Edit customer permission. Click on the Customers option in the navigation menu. Select the customer that you want to convert. 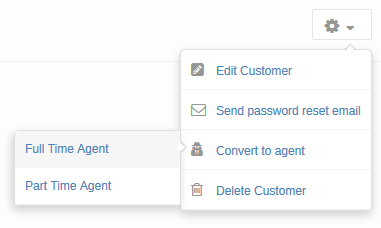 At the Top Right of the page, click on the drop down menu and select Convert to agent. Select the agent type, Part time or Full time. Available options are based on your subscription plan. Note: If you are currently subscribed to Trakdesk and select the Full Time agent option, your account will be instantly billed for the new agent account.